Shinryo Saeki's "Aisatsu" means "greetings" in Japanese, and the book presents itself quite boldly. 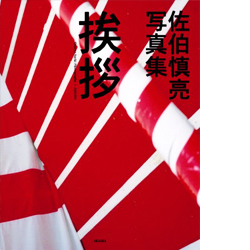 The cover and binding of the book is all bright red and white, colors which have a specific meaning In Japanese culture: life and death. This motif is reflected throughout the book, not only through images with strong red and white elements, but also the juxtaposition of images dealing with these themes. A baby crawls through a house on one page, while a funeral procession walks by on the next. Perhaps it's because he is a monk that he's able to think so clearly, and at times almost humorously, about these questions. Saeki shows a light, human touch in dealing with these heavy topics. The color photos in "Aisatsu" are a refreshing look at life and death in Japan. this book: information about each photograph (date, location, film), full list of acknowledgements and subject credits, text by Shihoko Iida.